Grand Rapids, MI – February 15th, 2013 – Munsell Color, part of the X-Rite company and the leader in producing physical color standards, today announced its latest new book release, The Munsell Soil Color Book. The book is organized to make it faster and easier to identify and communicate the color of soil in the field. For archeological applications, the Munsell Soil Color Book helps archeologists classify artifacts based on the color of soil found nearby. The soil classification system has been developed around the Munsell Color System as an established and accepted process to assign a soil type. 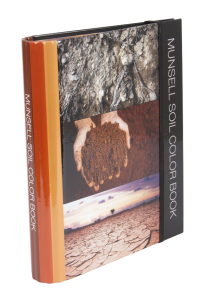 The Munsell Soil Color Book is a durable, accurate method for classifying and judging soil samples of all types where you need it most… in the field. Designed as a portable and durable guide to the Munsell Color System that lets people match, specify or design soil color anywhere. I am in South Africa but and I would like to order the new Munsell Color Book. We don’t have a distributor in South Africa. If you can arrange for pick up from the US or provide a shipper # to cover the freight we can ship to you. Please email munssellsales@xrite.com for further inquiries about this.